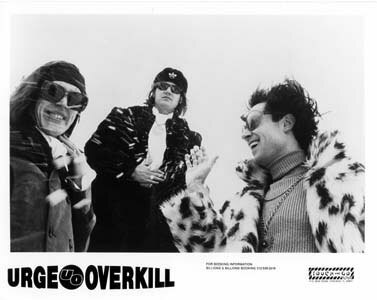 Urge Overkill, a name taken from a Parliament song, was created by guitarist Nate Kato and his long-time friend and bassist Eddie Roeser in 1985. The duo was accompanied by a revolving cast of drummers over the first several years. They released their Touch and Go debut in 1987 with the Witchita Lineman single, recorded by Steve Albini. Their first full-length Jesus Urge Superstar, also recorded by Steve Albini, was released in 1989, and was as quirky as the name suggests. But, for those who were paying attention, it was full of the promise of things to come. Their follow up album, Americruiser, was recorded by Butch Vig and released a year later. More straightforward than Jesus Urge Superstar, Americruiser won them many new fans as their songs and sound became more akin to catchy rock anthems. Blackie Onassis became Urge�s permanent drummer prior to entering the studio with Steve Albini to record 1991�s acclaimed The Supersonic Storybook, an album that gained the band notoriety throughout the rock underground. Widely recognized as the classic Urge album, both the songs and the recording made it the most accomplished Urge Overkill album yet. With their gold medallions polished and maroon velvet blazers fresh from the cleaners, UO recorded the Stull EP with Kramer, which Touch and Go released in August of 1992. Quentin Tarantino created a pop phenomenon with the first track, �Girl, You�ll Be A Woman Soon,� a Neil Diamond cover, which he used in a pivotal scene in the movie Pulp Fiction. After the release of the Stull EP, Urge Overkill signed to Geffen and released two more albums before breaking up.